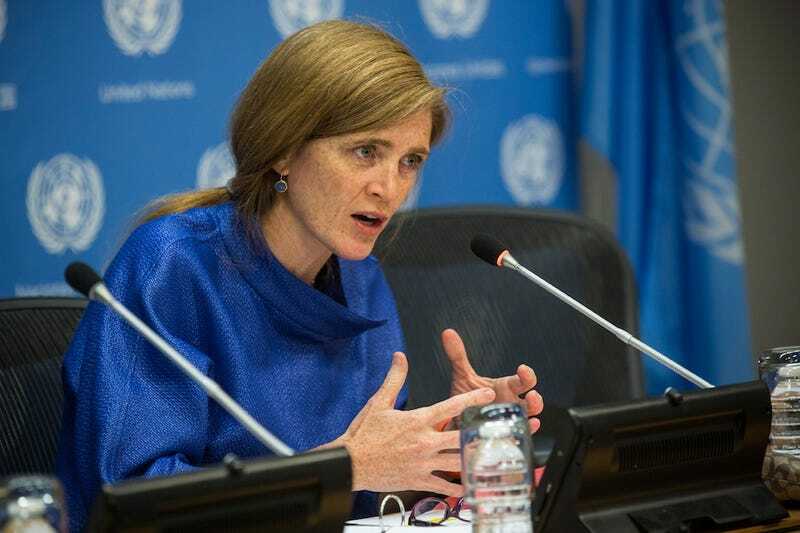 Samantha Power, Goddess of the U.N.
Samantha Power, who last year became the youngest ever U.S. Ambassador to the United Nations at the age of 42, is the subject of a lengthy profile by Evan Osnos in this week's issue of The New Yorker. In the profile, Osnos dives into the elaborate dance of hyperbole, abnegation, and spin-spin-spin required of all who enter our beloved political system, tracking the strange contrariety that marks the close relationship between Power, an idealistic liberal interventionist, to Obama, whose decisions are often marked with calculated reluctance. Power and Obama entered the Administration farther apart than their pedigrees and their friendship might have suggested: she advocated intervention and American exceptionalism; he spoke of America as the most powerful leader in the world, but recoiled from the adventurism of the Bush wars and the presumption of enduring American primacy, focussing instead on the need to rebuild the country at home. After nearly six years, Power still believes that America retains the capacity for brute or moral force to shape the course of global events—to bend the curve—but Obama, by his own account, does not. "I was expecting this sort of N.G.O. girl, considering her past, considering the book she wrote. Actually, she's a nice mixture of liberal interventionism and Realpolitik." "As a Frenchman, I'm not condemned to be politically correct, and one day we were on the Security Council, and I sent her an SMS saying, 'On behalf of the French delegation, I want to tell you, you are very beautiful.'" Power responded with, "This is one of the nicest SMSs I have ever received." Vox jumped all over this yesterday with a benign but under-researched piece on how even Power deals with sexism ("Either respond positively and risk being seen as unprofessional and flirtatious, or respond negatively and risk being seen as rude. I'd wager that that's a tradeoff that every working woman in America has had to make"), failing to note that Araud is, ahem, gay. Was he being inappropriate? Probably. Flirtatious? Nope. Today, more than six years after a word nearly cost her a career in government, Power exhibits a kind of post-gaffe stress disorder. Fiery and profane in private, she tends to be mind-numbingly dull on the record. When I asked her a benign question about what she'd learned working for the Administration, she said, half-jokingly, that she had no concise answer "other than 'Don't trust the press.' " If she doesn't like a question, she squints, pauses, and then parses it into as gentle a query as possible. When she appeared on "The Daily Show" last month, Jon Stewart set her up to make an easy crack about Congress. She replied, "We are hopeful that we will see Congress act in support of the effort we are undertaking," leading him to remark, "That was super diplomacy. That was Ambassadorific." "You learn in government what the obstacles are. But that's not so you can go take a nap. It's so you can figure out how to scale them or work around them. Does one get a better sense about context and about impediments and about trade-offs in government? Absolutely. But those are not alibis—those are problems to be solved."